It was April 2008. We had just turned in our life book and application into Crisis Pregnancy Outreach (CPO) and went to our first meeting. I’ll be honest about this – I was not only skeptical, but disbelieving. I thought there was “no way” we would be selected for a baby. After all we had been through, I just knew I was going to face another disappointment. I didn’t tell anyone but my husband what I was thinking. What’s funny is that many couples must feel this way because at the monthly meetings, the couples with babies express that you WILL get a baby. I just had to keep telling myself that maybe this was true. A few months passed, and we continued to come every month and volunteer where we could. Meanwhile, we followed the advice of CPO to have a room ready for a baby to come at any time. We got a call from one of my family members in July 2008. My relatives’ children had been taken into DHS custody. Would we consider fostering them? Oh boy! We discussed it and although both of us really didn’t want to go through what we did in the past with our DHS failure, we also knew that if anyone was qualified to do this and had the space waiting, we were. We already had a baby room ready with bassinet, crib, some baby supplies, plus an additional room with a twin guest bed. We even had car seats. This sibling group was a 3 1/2 year-old girl (Seryna), a 23 month-old boy (Jax), and a 2 1/2 month-old infant girl (Lauralei). It was a Friday night, and they were literally dropped off with the clothes on their backs, one half-full, disposable bottle, and no diapers. I’m thankful for what we did have because they came with nothing. The first order of business was clothes, diapers, and formula. My mother and mother-in-law came that first weekend, so my mother went shopping for us, thankfully. Now, I logically agreed to do this because it made sense, but emotionally, I wasn’t ready. My thoughts almost immediately were, “What have we taken on?” This was hard. The kids were sweet but had never had proper guidance. As a couple, we had never had three children, let alone an infant and two toddlers at the same time. By Sunday night, I had had a major meltdown. We believe due to the time these little ones spent at the shelter before coming to our house, they gave us a terrible flu. Everyone got it, including our moms. Whether it was stress or lack of sleep, I didn’t recover from it. In fact, I was dragging for months. My husband was convinced it was just stress from taking care of the kids that was making me so tired. Of course, it didn’t help that I continued to work full-time from home, working late into the night and then taking care of little ones during the day. We also continued to volunteer at our church’s addiction program on Friday nights, which kept us very busy as well. A few months had passed, and we attended the September CPO meeting on a Thursday night. I remember feeling very little strength to even change the baby girl’s diaper. I also remember thinking it was okay that we hadn’t been selected because I was pretty busy, YET I was also feeling down because another couple that had put in their application at the same time had already been selected by a birth mom. Honestly, it was a crazy mix of emotions. The next day, Friday, while helping during our addictions program, I pulled my husband aside and told him I thought I needed to go home because I was so tired. He just really didn’t get it and pushed me to make it through the night, so I did. Once I got home, I went to work all night on a project I needed to finish. By 5 am, I came and woke my husband, saying I couldn’t finish my project because I was too tired and didn’t think I could make it to the DHS classes we had scheduled Saturday morning. He said okay and I went to bed – for the next 3 days. I didn’t know that I had had a fever Friday night and I didn’t realize how sick I was either. On Tuesday about 5 pm, we got a call from CPO telling us a woman was about to deliver a baby and she wanted to meet us. Wow! Of course, I told my husband the timing was terrible, but there was no way we were missing this opportunity. We called some good friends who took our kids for the evening (so we thought) and went to meet this young lady. She almost immediately said she had chosen us for her baby. I was in shock and also feeling very ill at the same time, but I didn’t want to look sick in front of her because I wanted her to know we were happy. We met her at 7 pm, and by 8:01 pm, our baby girl was delivered. It took about 10 minutes before we got to meet this amazing little one. She was absolutely perfect, and we were so excited. We were even able to get a room on the floor. By Wednesday, I knew I needed a doctor for myself and ended up in the ER at the same hospital. I was almost immediately admitted and eventually found out that I had bacterial strep A, was put on strong antibiotics, and iced down with fans running on me. My poor husband was running between two wings of the hospital. The nurses gave my husband a baby name book for me to look at and choose a name. We had a named picked out before our foster kids came, but it didn’t seem to work once we saw our baby girl. I cannot tell you how I picked a name because I could hardly look at it for more than a minute. I would literally flip to a page and look, then put it down. I think I flipped it to the middle of the book and at the top of the page on the right- hand side was the name Gabrielle. I thought, “That sounds nice.” This was a name we never discussed and never considered. I asked my husband and he liked it too. So, that was it. We named her Gabrielle. She went home with my husband on Thursday while I stayed in the hospital until Saturday, insisting I get released to go home. Our foster kids came home on Saturday, too. Our poor friends ended up caring for them all those days to help us out. Meanwhile, I decided to look up what Gabrielle meant. I had not made the connection in my mind of the origin of this name. This was my epiphany moment. Gabrielle means “God is my strength.” This is when it dawned on me that it’s a form of Gabriel, and I immediately felt that God chose her name and was sending me a message of where my strength is found. It was a good reminder to me that God was there, helping me through a time when I was weak, physically and spiritually. It definitely helped me have faith that God can and will do the impossible. During our trials over the next few months, I was able to draw my strength from God instead of relying on my own strength, which has always been my tendency. We made the decision for me to quit working and solely concentrate on the children. With that came great consequences, financially. We struggled to pay for all of our adoption fees and costs, and because we had not finished our DHS classes due to my illness, we were also not getting compensation from them yet. From this moment until now (4 years later), we have not completely recovered from our financial losses, but we are far from where we were back then. The few years ahead were very hard. In November 2008, two months after Gabbi was born, we found out at a DHS visit while the biological parents were seeing their children that the kids’ birth mom was pregnant again. This meant another child was coming during an open case. We decided not to talk about this subject at all and focus on the four little ones we had in our house already. Eventually, we were faced with deciding whether or not we were willing to foster another infant when he was born in June 2009 (Joel). Logically, it made sense to keep these siblings together, but emotionally, it was a very hard task with everything else going on in our lives. We said yes. In a matter of 11 months, we went from a house with no children to having 5 children under 5. Fostering is no guarantee because these children have visits with their biological parents, and we attend court dates to hear the progress of the case. Eventually, the biological parents decided to relinquish their rights in September 2009, giving us the option to adopt. We, of course, could not imagine doing anything else because we had all bonded as a family. Then, the unthinkable happened – my husband lost his job in November 2009, which put everything in jeopardy. We were almost without income for five months while he looked for a job. We had money from unemployment and fostering, but that’s a very small amount of income for a family of seven. We made it through, and the very week that unemployment benefits were cut off, my husband received his first paycheck. This is so significant because we had a particular volunteer CASA worker who wanted to remove the kids (over a disagreement we had) and without unemployment income, we were considered technically without income, making DHS able to pursue removal of the kids. With my husband’s new job, this avenue could not be pursued, so again God intervened at the last moment for the benefit of our family. During this time, I could not name all the blessings that were building my faith. Like the situation above, where it was at the last minute, knowing tragedy was right around the corner, we were always saved. We were given money, food, supplies, and clothes without asking, and many times, it was just at the exact moment we needed something. Over and over it played in my mind, “God is my strength.” God continued to intervene until we were able to finalize the adoption of all of our DHS foster kids and our private CPO adoption. I look back, knowing that God answered my question, “If children are a blessing and heritage from the Lord and a reward, then what was God saying to me?” While I was discouraged, angry, bitter and unbelieving, God was already working. He was saying to me that I greatly blessed. All I needed to realize was that I needed to have patience and wait on God. I wake up everyday still amazed at how blessed I really am. I’ll admit; this is probably the hardest thing for me to write about. When it comes to my emotions, I like to bury them deep, especially when it comes to painful topics. So, it has certainly taken me a while to get myself to a point to sit down and write this. And still…it isn’t going to be easy. I’ve really known all my life that I would never naturally have a baby. I don’t know why I felt that way, but I did. I had a lot of problems in my younger years with irregular cycles and as I got older, they got farther and farther apart. I worried in silence, and the doctors never offered me any solution but to take birth control (which didn’t seem to make any sense to me). So, I just ignored it for a long time. I finally talked about it when my husband and I got engaged. I sat him down and told him. At the time, I don’t think he took it too seriously. I think he believed I was over-thinking things and exaggerating. We got married on Valentine’s Day 1999 and began our life together. He was 27 and I was 28. We went about our lives, working, buying a house, collecting stuff, and not thinking about it. After about two and a half years, when I turned 30, I started thinking it was time we start thinking about a baby. But we didn’t seek a doctor for quite some time. Finally, we realized it was going to require some testing and help. This is when I was diagnosed with Polycystic Ovary Syndrome (PCOS) from my doctor. Syndrome? What did that even mean? But there was hope. I was to take some meds, monitor my temperature every morning, do some ovulation tests, etc., and come back monthly to be monitored. The first few months were hard because my charting was not turning out as expected. So, the doctor increased the dosage. I’m the first one to avoid any kind of medication because I am so sensitive to side effects. Oh, I felt awful taking this, but I continued. This time, my chart looked exactly how it was supposed to. I was so excited to come back and get an ultrasound. The disappointing news was I didn’t even ovulate. I told myself I wasn’t going to be an emotional basket case. I was just going to follow the doctor’s instructions without expectation. That is impossible. You spend too much time on this chart and temperatures and tests to not be very emotional throughout the process. The doctor told me that I was a case that was going to require a fertility clinic. But, as someone with PCOS herself, my doctor warned me that the drugs (daily shots) were going to be much worse than what I was already taking and told me how her own husband made her quit them after only one month because of how “crazy” they were making her. Add to that the cost of $2500/month and I was just crushed. I had to take a break from it for a little while. We eventually decided instead we would adopt through DHS. It took several months of background checks, home studies, and classes before we were approved. Then we waited and waited. Finally after about a year (and by this time I’m 32), we were given the option to be placed with two boys, ages 4 and 6. We said yes. Within a month, we had the two boys in our home. It was both a wonderful time and a very trying time. We were unprepared. As much as the classes try to teach you, it’s an experience no one understands until going through it. We failed. After a year, we decided not to adopt. A few more years go by, and during this time, my husband gets saved. Yes, he was an atheist (a nice one), but nevertheless, an atheist. So, even though I got saved as a child, I had spent much of my life apart from God. By my husband getting saved, it brought both of us to the Lord. We both believe that our loss and failure with the boys set him on a journey that ultimately brought him to the cross. What a blessing from such a tragedy. As a result, we found a good church home and some great friends. Even then, we didn’t talk with anyone about this. There was more suffering in silence. As far as anyone knew, we just happened to be a childless couple married six years by this time. So, we dedicated ourselves to serving the Lord and helping others. It was not longer after, we found out about a local ministry, Crisis Pregnancy Outreach (CPO), from another church member who had adopted through them. It was 2006 by this time and we agreed to go with this friend to a meeting. Many different people adopting were giving their testimonies, and one couple told of their failed adoption in which they were raising their baby and the bio father came back into the picture and ended up with custody after they had him for quite a while. That completely terrified me and I left thinking I cannot endure any more losses. I can’t do it. By the way, I’ve heard so many people say that there are unknowns in a pregnancy (and there are) and unknowns in life (of course) and they equate it to the adoption process. But, I don’t think it really compares. This journey felt hopeless to me. It was beyond me and out of my control. And because of that, I avoided it. Like I said, we dedicated ourselves to serving the Lord, but for me, I never trusted the Lord. I did most everything in my own strength. So, choosing to go through the adoption process now would mean I need to learn to trust the Lord in whatever happens including a potential loss. It took another two years. During this time, we got a phone call from my mother who heard about a lady about to have twins. She had found an attorney to help her locate an adoptive family. It was very short notice so I wrote a one page “life story” and sent it in. She chose three families to interview and we happened to be one of them. I was nervous, worried and excited. We fasted and prayed for three days and I was certain that this was God’s answer to our prayer. We could in one moment have our family complete. We were the second couple to meet with her. She seemed nice and things went well. We had church friends praying for us during this meeting as well, so I just knew this was it. We saw the third couple arrive as we left. The next day we found out she had chosen the third couple. Once again, I was crushed. I was so sure about this. I told the attorney I needed to know what was the deciding factor and he told me that she was leaning towards picking us after we left and he agreed that we were also the best fit, but then the wife of the third couple begged her and pleaded with her to pick them so she did. It all seemed very unfair. But, it was done and we were back again, facing this ever-so-vast emptiness in our hearts. Why, I kept wondering,”was the Lord doing this? To be honest, I was quite angry about it. I remember so many Mother’s Days, thinking if children are a blessing and heritage from the Lord and a reward, then what was God saying to me? I felt punished. But, I never told anyone but my husband what I was thinking. I knew it was wrong, but I had no way to feel differently about it. Despite that, in 2008, married nine years and at age 37, I remember running into the church member, who now had two adopted children through CPO, and thinking to myself, “What am I waiting for?” It finally dawned on me that by trying to protect my heart from another potential loss, I was also pushing away any potential blessing God might have in store. So, while I was bitter and angry with God, I finally realized that I had a role to play, which I had been avoiding. We almost immediately made a life book, got our application filled out, and went to the very next meeting turning it all in to CPO. And the real test of faith began. We have learned to encourage ourselves through solitude with God and through Scripture, particularly the Psalms. Lastly, we can encourage ourselves through song. I enjoy current gospel music. Many songs have encouraged me and lifted my spirits, but my favorites are the enduring hymns. They are classic and they don’t sound dated. Two hymns in particular ministered to me the most during my journey of infertility. I wrote about it many times in my journal. One of them is “It Is Well With My Soul”. The story behind the writing of “It Is Well With My Soul” is perhaps a familiar one. Elisabeth Elliot’s Secure in the Everlasting Arms presents it in more detail than I have ever heard in the past. The great Chicago fire of the 1870s caused Horatio Spafford, a wealthy businessman, to take stock in his life. Wanting to know Jesus better, he decided to sell everything and move to the land where He had walked. Shortly before the ship sailed, he was delayed by business, but took the family to New York. For some reason he was unable to explain, he had the purser change their cabin, moving them closer to the bow. He returned to Chicago to finish his business. Then came a telegram: SAVED ALONE. The ship had sunk. Mrs. Spafford had survived. Their four daughters had perished. Had they been in the cabin originally reserved amidships, all five would have drowned, for it was there that the steamer had been struck by another vessel. Mrs. Spafford described that terrible black night when she and her four little girls were flung into the cold sea. Frantically, she had tried to save them. Barely, she had been able to touch with her fingertips the hem of the little gown of one, but could not grasp it. She herself had been miraculously rescued as she floated unconscious on a piece of flotsam. During Mr. Spafford’s voyage to join his wife in France, the captain summoned him one day to the bridge. Pointing to his charts he explained that it was just here, where they were at that moment, that the other ship had gone down. Spafford returned to his cabin and wrote the hymn, which has comforted countless thousands. Mrs. Bertha Spafford Vester, the fifth daughter of Horatio and Mrs. Spafford, who was not born until after the tragedy, told this story to Mrs. Elliot. What a joy to know God blessed them with another daughter! When peace, like a river, attendeth my way, when sorrows like sea billows roll. Whatever my lot, Thou has taught me to say, It is well, it is well with my soul. Though Satan should buffet, though trials should come, let this blest assurance control, that Christ hath regarded my helpless estate and hath shed His own blood for my soul. My sin – O the bliss of this glorious thought, my sin, not in part, but the whole is nailed to the cross, and I bear it no more: Praise the Lord, praise the Lord, O my soul! And, Lord, haste the day when my faith shall be sight, the clouds be rolled back as a scroll: The trump shall resound and the Lord shall descend, “Even so” – it is well with my soul. Early in 2003, I had my final attempt at ovulation induction with IUI. It didn’t work. I was still struggling to accept it might not be God’s will for me to get pregnant. Adoption was next, and IVF was not yet in the picture. When my husband William and I got married in November of 1997, we were both ready to begin our family immediately. Little did we know, God had other plans for us. After four years of trying to conceive and to no avail, we decided to seek medical help. For years I had doctors tell me that there was nothing wrong, that we just needed to relax and quit worrying about things and that if we were not so uptight, it would happen. These questions plagued me for years, and like many other women who have struggled with infertility, I watched time and time again as my friends and family conceived, carried their babies to term and delivered beautiful, healthy babies. My emotions were so unstable during this time. My friends and family were afraid to share their joyous news with me, which hurt me because I truly was so happy for them, but every positive they received made me feel so sad about my situation. It seemed like a never-ending roller coaster ride that I didn’t want to be on. I think the most hurtful thing during that time was that I felt that God was not answering my prayers but pouring out blessings on everyone around me. I compared my state to that of Hannah in 1 Samuel 1:10 as she dealt with her own barrenness, “ And she was in bitterness of soul, and prayed unto the LORD, and wept sore.” I truly was in this state as well. I prayed, I wept, and bitterness was beginning to set in on me. I felt so self-centered and selfish, always thinking about me and my condition. Looking back, those were some very sad and lonely times for me. Over the next few years, William and I considered in vitro fertilization (IVF). We even got as far as meeting with a physician and were actually filling out the paperwork when both of us immediately knew that this was not the path that we were to be taking, at least not at that very moment. We continued praying and searching for alternative ways to build our family. An attorney introduced us to the idea of adoption. We first looked into overseas adoption, but could not find peace in that decision and decided that was not the path we were to take either. We finally settled on becoming a resource family through the Department of Human Services. This decision was absolutely life changing for us and I mean that in the best way! I still can’t believe how everything fell into place as we began to start our family and I would like to share a few pieces of that story with you, so you can see just how great the Lord worked in our lives. We were approved in August of 2003 to become adoptive parents. I was praying that we would be placed with an infant. I wanted so badly to experience that part of motherhood. Our social worker told us it would take some time to be placed with a child, especially an infant, sometimes it could take several years. I was very surprised when our phone rang in December of that same year with a possibility of a 3 ½ year-old boy. I have to admit, at first, I was not on board with the age of the child; I was hoping for a newborn or at least a baby that was under a year old. I went and met with the social worker and as soon as she showed me the pictures of Tevin, my heart melted….I saw a beautiful little boy who needed a home. My eyes were not clouded with age; age didn’t matter. He was such a cute little guy and so in December of 2003, Tevin came home with us! Talk about a wonderful Christmas gift. After only six months in our home, we finalized the adoption of our first child. We were finally parents and I was a mommy! God had answered our prayers! God was so good to work out so many problems that could have occurred during that process and then, He continued to pour out blessings on us over the next few years! In November of 2005, I was called to give temporary care to a newborn baby boy for another foster parent who was dealing with health issues in her family. That temporary care turned permanent the first week of December and it looked like this little baby might possibly be up for adoption as well. On December 19th, I received a call that they had found a family for the baby to live with. I was very heartbroken. Although the goal is always for reuniting with the parents or biological family, in the back of my mind, I always thought what if…I was not prepared for the phone call that I received three days later. I received the call on Taleah on December 22nd. Her birth mother was in the hospital delivering her as we spoke, and they wanted to see if I was up for keeping another newborn. I hesitated after they told me that she had three other siblings in custody and that the only reason she couldn’t go there was because that foster home was full; however, if a spot opened, they would move her to be with the siblings. I almost said no, but something (God, I believe) prompted me to say yes and so we took her. The next day, I went and picked her up. She was amazing and I fell in love with her quickly! Two days later, on Christmas Day, I knew that her leaving my home would be too hard for me to take, especially if her stay was extended, so I wanted to meet with the other foster family and tell them my heart or tell them to take her quickly because the DHS workers really felt that this baby would go up for adoption. We went out to my mother-in-law’s for Christmas dinner and she had a HUGE surprise for us! The other family that had the other three other siblings was her current preacher and his wife, who was also my husband’s and my former preacher! They too were resource parents in another county. They had already adopted two of her siblings and had the third in foster care at the time but knew they could not keep taking this couples’ children. Space was limited and they already had ten children in their home with plans of adopting them all. They had been so burdened by not knowing where Taleah was that they had decided to call DHS after Christmas and tell them that they would do whatever they needed to make a space for her. They were telling this story to my mother-in-law and when they compared details, they realized that we were the other foster family. When they found out that she had been placed with William and me, we all knew that God had worked this out perfectly and that it was a miracle. MANY tears of joy were shed that day! Several huge things happened that don’t normally happen in a case like Taleah’s that I want to point out, so that God can get all the glory. First of all, her siblings resided in another county and the fact that her mother delivered in our county opened the door to us even being able to foster her temporarily. Secondly, had the little boy that we had in our home not been removed three days before Taleah was born, we would not have been the ones to receive that telephone call. God’s hand TRULY was present in yet another wonderful Christmas present for us. Telling that story still gives me chills, it is so AMAZING and hard to believe that it happened at all, let alone the way that it did. Everything just fell into place perfectly. After being blessed with our first two children through adoption, we decided that the timing might be right for us to try IVF. We still struggled with the thought that perhaps we were taking things out of the Lord’s hands if we sought this route of treatment. After talking with my pastor’s wife one day, I was explaining to her that I felt so selfish for still wanting to conceive and carry a child, especially after the Lord had been so good to us through adoption. She said two things that really helped me get past any struggle I had with IVF. The first was, it wasn’t selfish of me to want to be a mother in the sense of carrying and delivering a child. God had created women to fulfill that very function and that He had placed that desire in my heart as a woman. The other was the struggle that William and I dealt with on taking things out of God’s hands. She said to me, “Gina, if God does not intend for you to bear a child, you will not bear a child. You cannot take anything out of God’s hands!” Her words of counsel put us at complete ease with pursuing IVF. If the process worked, great! If it didn’t, we had already been blessed with two beautiful children. We were referred to a wonderful doctor and in the fall of 2007, our third child, Kaylee Rose, was born to us. Our final addition to the family arrived in the spring of 2009. We named her Kimberlee. I’m not sure of the exact statistics on IVF, but I know that the percentage of success on a first try is somewhere around or below 50% and on frozen cycles, the success rate is much lower, probably around 35% or even lower. We tried two cycles and both were successful! I am still in awe at God’s allowing us to experience the joy of parenthood by adoption and by conception. 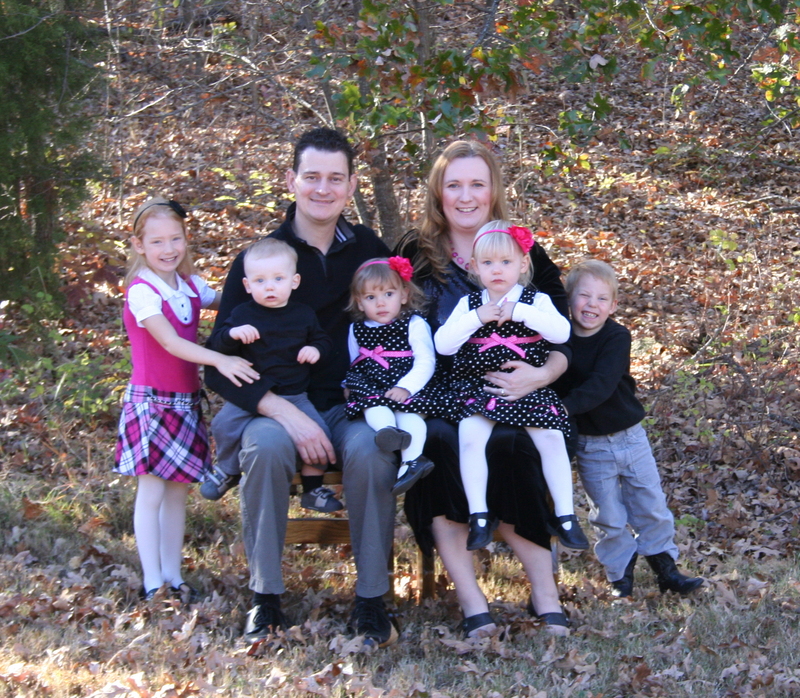 One boy and three girls later, our family is complete, unless of course the Lord decides to allow us any more children! Looking back over the last thirteen years, I can now see how important it was for us to wait on starting our family. God was trying to teach me patience so that I could experience the full blessings that He had in store for me. In Romans 5:3, the Bible says ”And not only so, but we glory in tribulations also: knowing that tribulation worketh patience.” This verse proved so true in our situation. Had we been able to immediately conceive and not go through the tribulation of infertility, our family would not be complete because we never would have considered the adoption process and we would not have Tevin and Taleah today. God had other plans for our family. He had bigger and better plans for our family. While I couldn’t see His plan clearly years ago, I can now see clear as day just what He had in mind. I learned a very important lesson through all this and it is that the best blessings come “In His Time.” Some things are worth waiting for! Our Quest for a Baby: Is Adoption a Yes, No, or Wait? We thought our final attempt at IUI with ovulation induction in early 2003 was our last chance for me to get pregnant. And we yielded our desires if the Lord was now leading us to adopt. In the spring of 2003, I started looking at some adoption websites and made some phone calls to a Christian adoption agency, an adoption attorney, and Indian Child Welfare to find out more information and to ask a few questions. I’m not sure why, but I almost cried when I told one lady we were just starting to search this out. Both of our fathers had shared their thoughts on adoption. We had the blessing of our parents. We were starting to get comfortable with the idea of adoption. As Christians, we are adopted in Christ! Three couples we knew had gone through an adoption attorney for their adoptions, and we decided to go forward with her; she said she had done about 1800 adoptions, and ours might possibly take 4-5 months as her waiting list was not long and she got a lot of calls from hospitals, etc. It sounded a little scary to think we could have a baby that quickly, when being pregnant meant twice as long of a wait! I thought it would be neat to see where our baby would come from. We also contacted ICW and were told it could take 3-6 months to get set up, but in just over a month they were ready to set up an appointment for our home study! It only took about 5 or 6 months after that contact with ICW that we started getting phone calls about private placements. At one point, we had gotten calls 4 months in a row. Each time I would wonder, could this be the one? We would pray about each opportunity and didn’t feel peace. We knew in our hearts with each one that we were not to pursue it, even though some I really thought could be the baby God had for us. I thought the day we would have a baby was at least getting closer. In addition to pursuing adoption, I also didn’t give up hope of getting pregnant and tried to go to a different doctor who helped me with progesterone and other alternatives. One day she asked me about adoption and then how I would feel if I never had children. I asked, “If I never conceived, never adopted, or both?” She said, “Both.” I remember saying matter-of-factly or confidently (in my God’s promise), “Oh, well, I know I will have children somehow because the Lord gave me Psalm 113:9, “He maketh the barren woman to keep house and to be a joyful mother of children.” I teared up a little and she hugged me, inspired to help me even more. I really hoped she would be able to help.